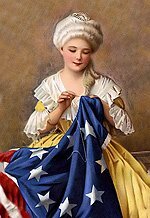 Betsy Ross’s name at her death was actually Elizabeth (Betsy) Griscom Ross Ashburn Claypoole – A Morris County man. June 14 commemorates Flag Day the birthday of the first U.S. flag, made by Betsy Ross (1752-1836) at the request of George Washington. Mrs. Ross, a seamstress, did not design the flag, but apparently came up with the idea of five-pointed stars. 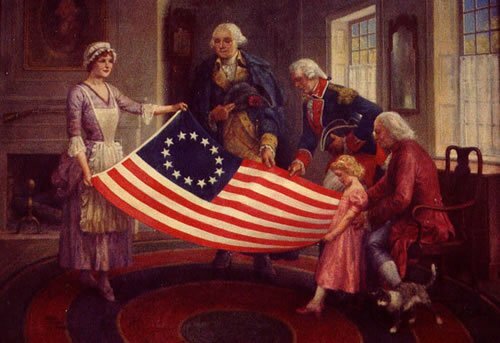 According to Ross’s grandson, Ross was visited in her home in June 1776 by Robert Morris, George Ross (her husband’s uncle), and George Washington, who asked her to create a new nation’s flag. Born in Philadelphia on January 1, 1752, she died there at the age of 84 on January 30, 1836. She was the eighth of seventeen children and was raised a Quaker, but was shunned by that denomination after eloping with John Ross, an Episcopalian. When she married John Claypoole, they were married for more than thirty years. 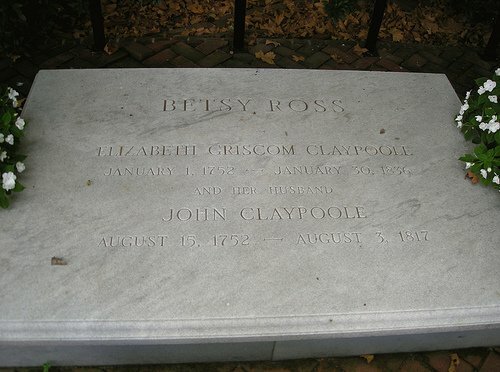 Today her officially listed grave is at the Betsy Ross House on Arch Street in the city of Philadelphia. Or does it? Is it correct or just a front? Accounts that Ross was buried in Basking Ridge were prevalent in the early 1900s. When doing research for a book about the Bernards Township Library in 1995, this writer found scrapbooks compiled by the late Dr. William Pennington which revealed clippings about the Ross burial. The earliest mention, however, was in a July 4, 1876 speech given by E.M. Pennington (relationship to Dr. Pennington not known). 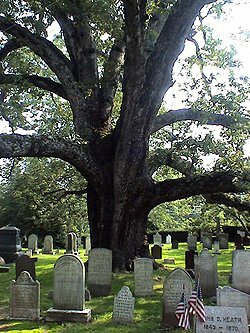 He states “Here lies the woman who made the first banner containing the stars and stripes after that honored old ensign had been adopted, June 14, 1776.” The speech was made in the vicinity of the revered old oak tree. The second reference in Dr. Pennington’s scrapbooks was a June, 1901 news clipping: “Oak Marks Grave of Betsey Ross”; “Maker of the First American Flag Buried Under a Giant Tree in Basking Ridge”; “Her Headstone Has Been Stolen”. In a newspaper, the Philadelphia North American on June 21, 1902, the headlines read: “Betsy Ross Supposed Grave to be Remarked”; “Under the Oak Shown Here Lies the Supposed Body of Betsy Ross”.Residents of Basking Ridge were about to raise a fund “to mark the spot in the old Presbyterian Cemetery where they say lies the body of Betsy Ross,” the article said. 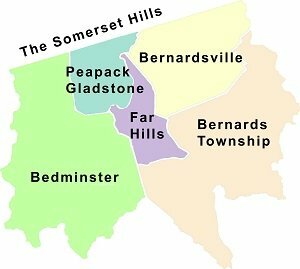 Over the past two decades, more than half a dozen references to this story have been uncovered in our archives at the Brick Academy and in the files of the Bernards Township Library history room. The first mention appeared in a clippings scrapbook compiled by retired physician, Dr. William Pennington, who lived around the turn of the 19th century and spent much of his life collecting newspaper articles. A Sunday, June 16, 1901 headline read “Oak Marks Grave of Betsy Ross”. 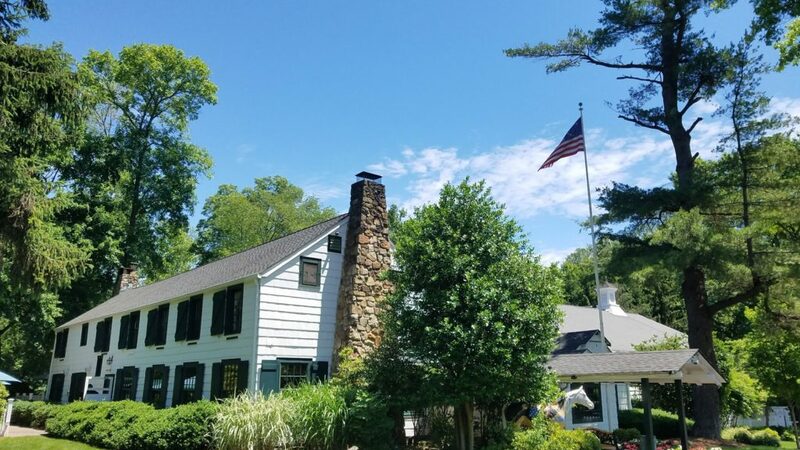 A sub-heading added “Maker of the First American Flag Buried Under A Giant Tree In Basking Ridge.” “Beneath the branches of the oak is Mrs. John Claypoole, known in history as Betsy Ross, the maker of the first American flag” the article said. “The village people are very proud of the fact that the remains of Betsy Ross rest in the old burial ground.” But the article went on to add that her “very comely tombstone” had been stolen two years earlier. Villagers apparently believed the tombstone was taken by “some historic relic hunters”. Two other sources made a passing reference for the alleged burial site. The Revolutionary War Scene in New Jersey, written by Robert V. Hoffman in 1942 and “History of Basking Ridge”, based on a play written by the Church of St James Holy Name Society in 1950. Inquires to the Betsy Ross House, Public Library of Philadelphia, Philadelphia Historical Society, and The Philadelphia Inquirer all proved negative. Officials insist Betsy Ross was interred in a park next to the home where she and her family lived at Arch Street in Philadelphia. What Does the Betsy Ross House Say? The Betsy Ross House reported that the seamstress had been buried three times due to city expansion. One problem is that burial records of the Presbyterian Church are incomplete. Ross was married three times and died as Mrs. John Claypoole. Her late first and second husbands were John Ross and Joseph Ashburn, respectively. In a July 4, 1876 centennial address, a noted orator referred to a spot under the oak tree as the final resting place of Betsy Ross, maker of America’s first flag. In 1901 Sexton John Craig recalled seeing a tombstone for Betsy Ross but said it had mysteriously disappeared. There are 35 Revolutionary War veterans and those of the country’s other wars buried at the cemetery. 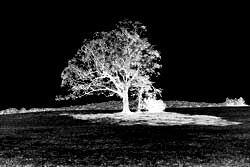 By June O. Kennedy – THSSH Newsletter – May 2009 and June 2004 with additional info added by Brooks Betz.